It was a great night of sleep with amazingly no snorers or rustlers out of 12 people. I was awake early at 5am and stepped outside to use the bathroom, brrr! 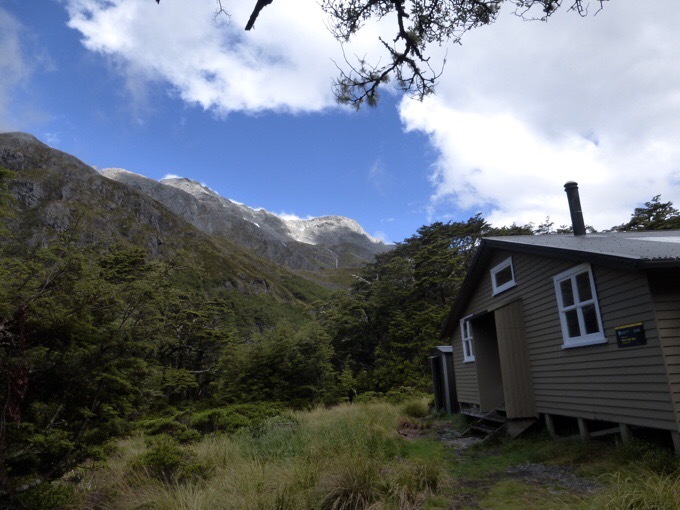 It was so warm and cozy in the hut that I had worn a t-shirt to bed, but it was in the upper 30sF/2.7C outside. I knew today wasn’t going to be a long day of hiking, so I laid back down to let it warm up a bit more before starting. People started rustling around just after 6am, and I got a relaxed start at 7:10am. 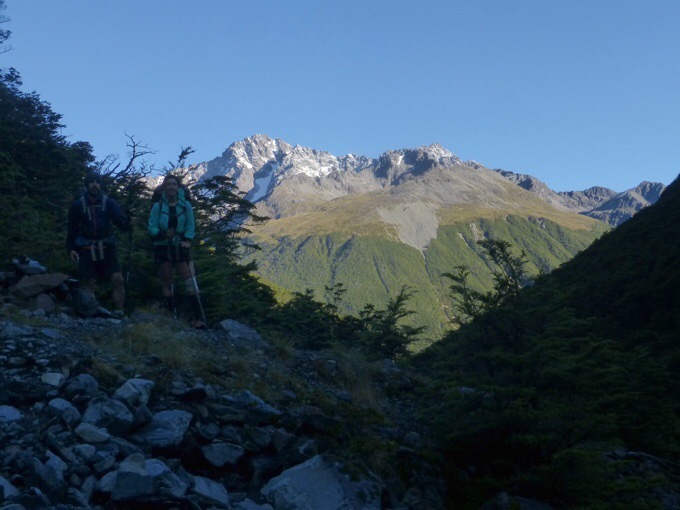 The first two hours of the day was forested with gradual uphill to Upper Travers Hut. 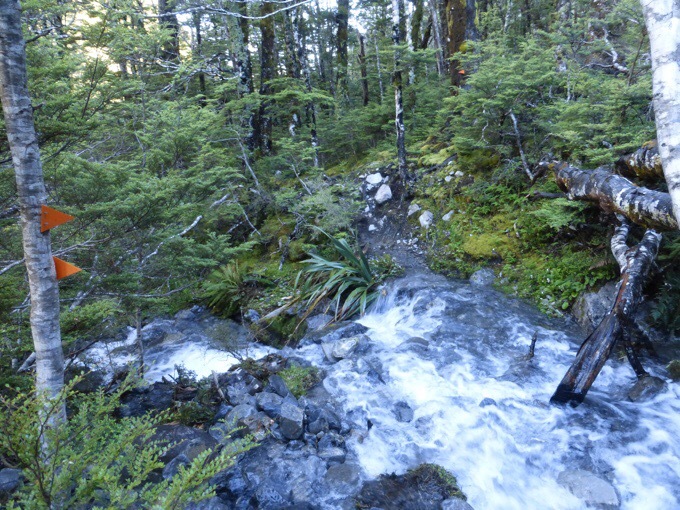 There was still water in the trail and some side streams to cross and they were painfully cold. Hikers Jasper and Bibi with the backdrop of our first grand mountain view of the trail. 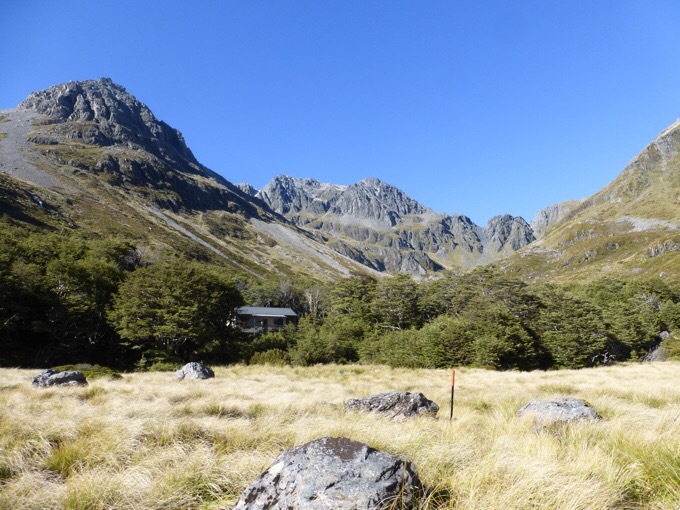 I got to Upper Travers Hut at 9:20am, about the same time as three other hikers. We all had really, really cold numb feet, even the ones with boots. The view from the hut. The others stopped to take a break and I decided to continue on up over Travers Saddle in the hopes that the climb and sunlight would warm my feet. Thankfully, it worked and they warmed quickly. Again, those orange poles coming in handy for delayed selfie photos! 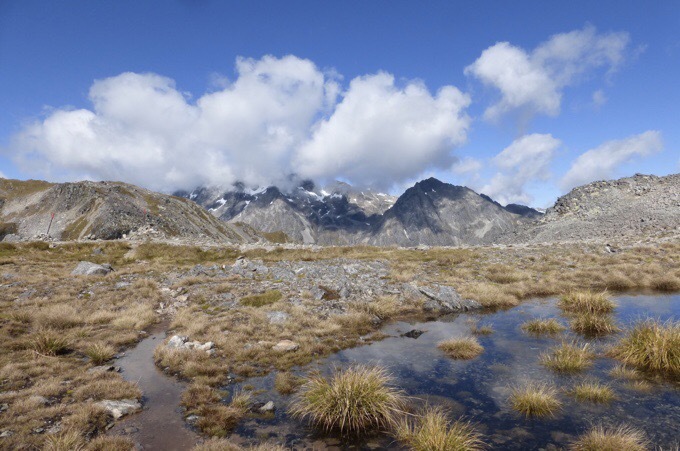 This section through the St Arnaud Range/Nelson Lakes National Park, is said to be one of the most scenic along the TA. 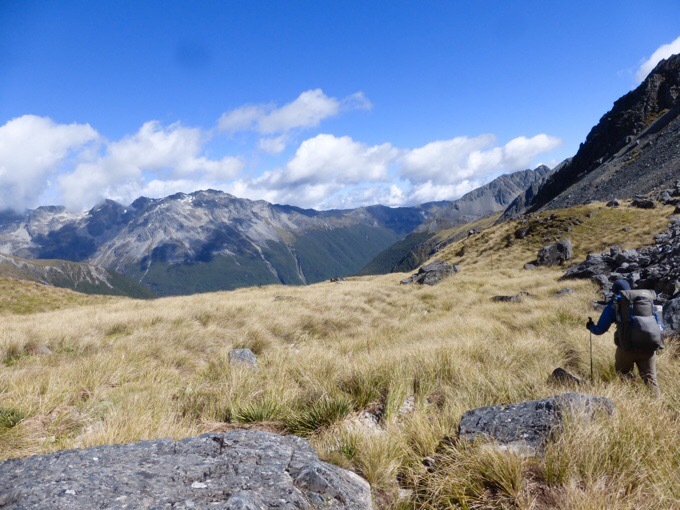 Going over Travers Saddle was definitely the most grand views thus far. Real mountains! It was a crisp morning with no wind or clouds. One of those moments that really wakes you up in many ways. Especially considering the downpour and flooding from the previous 36hrs. A woman painting on a ridge. Once over the top, I felt the cold which was still below 40F/4.4C, and put on my jacket, gloves, and beanie. Overall, the time spent above tree line was around an hour and a half, so my photos are mainly of the views, but it was a brief period in the overall day that was mainly wooded. Grand views though! 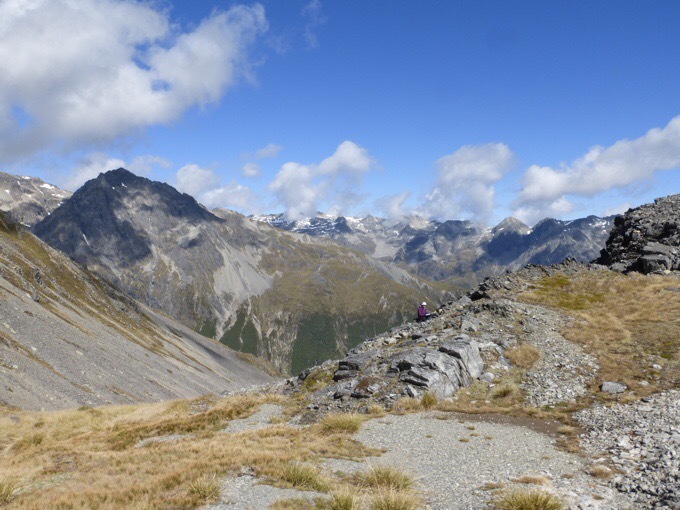 Then there was a steep drop down to West Sabine Hut. It was pretty fast downhill for those that like downhill. I was proud that I only slipped once going down on the sorta mulchy kind of ground that was a bit spongy seemingly from all the rain. 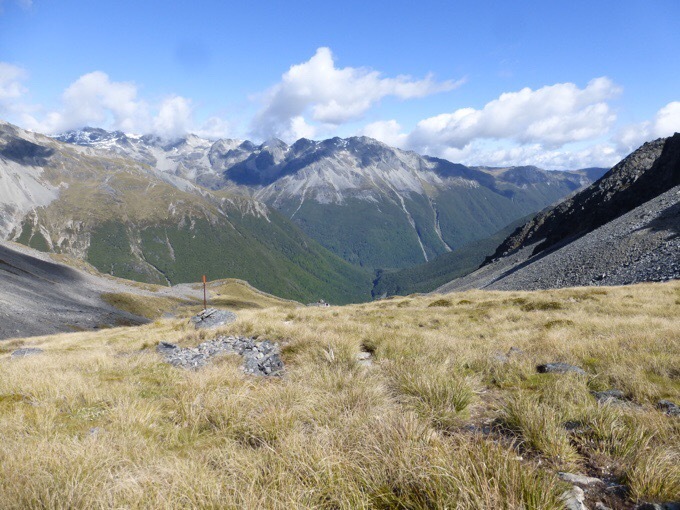 The notes and signage along the trail said to allow 6hrs to go the 9.5km from Upper Travers to West Sabine Hut. It must have estimated for much slower pacing on the steep ascent and descent because I was surprised when it took me 3hrs 20mins and I made it to West Sabine in time to have lunch there. 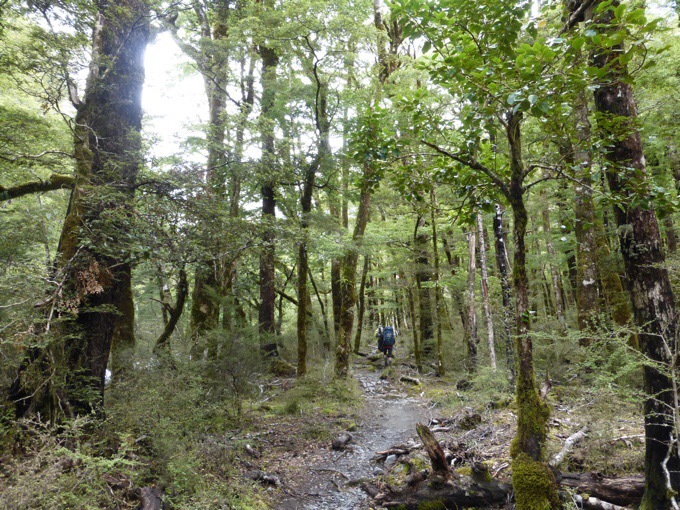 When I got there, I overlapped with TA hikers, Jeff and Lee, and we had an enjoyable lunch together. Lunch with Lee and Jeff. 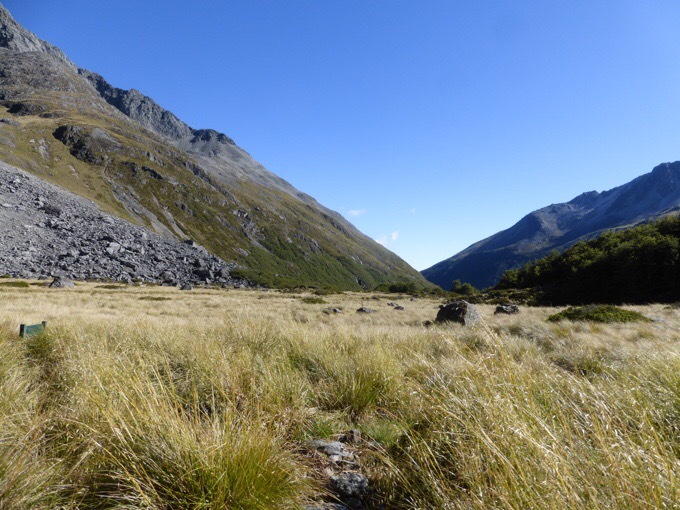 We hiked out at the same time, but then spread out as I moved on to Blue Lake Hut. Again, much of the hiking was wooded, but there were also some great views towards the end as the trail went along the Sabine River West Branch. The water was quite loud as everything is still draining from the big rain two nights ago. Waterfalls were falling in many places high up on the mountains as well. It was really grand once again, and a unique experience to see it so full of water. Looking back down the valley. 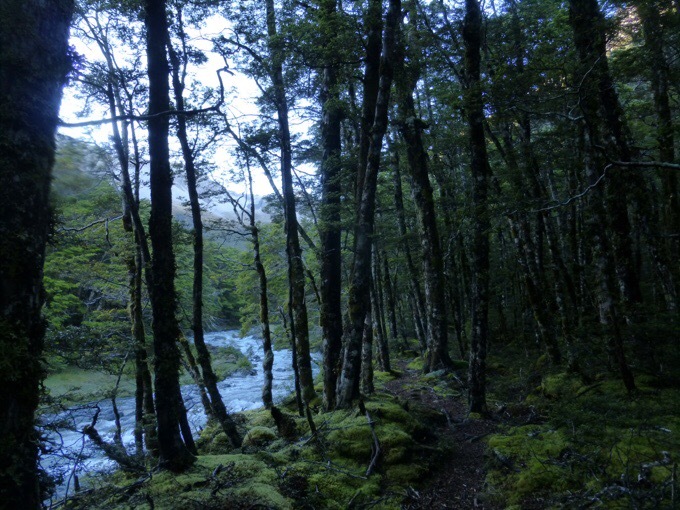 It started raining just 20mins before I got to Blue Lake Hut. I pushed and luckily got there just before a heavier rain at 4pm that lasted another 20mins. No one else was at the hut, so it was me and two active mice running around. 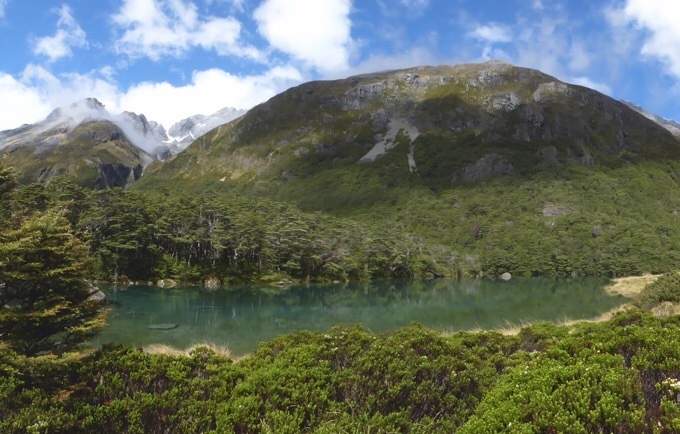 When the rain stopped, I did the two minute walk from the hut to see Blue Lake. I had really hyped it up in my head, and was disappointed that there wasn’t a good view looking down on the lake, so the grandness of it wasn’t visible. 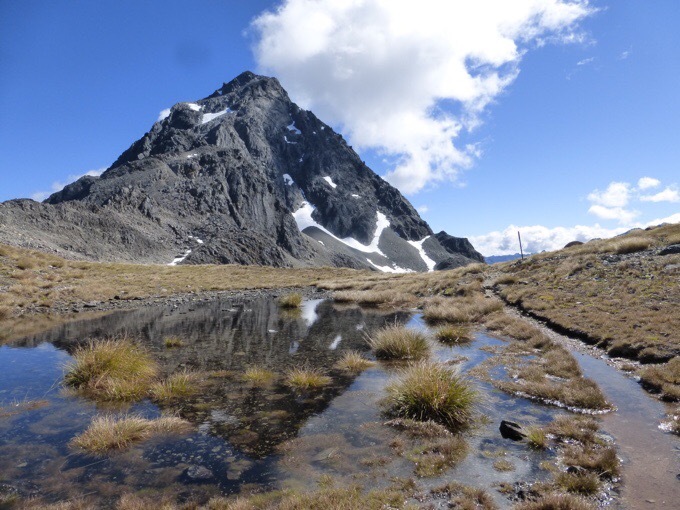 It’s said to be the clearest known freshwater in the world. There is apparently visibility consistently in the 70-80m range. The information board mentioned that it can be clouded after rains, and it seemed to be flooded, so maybe there is a better view normally. When I returned, more TA hikers arrived over the next couple of hours. 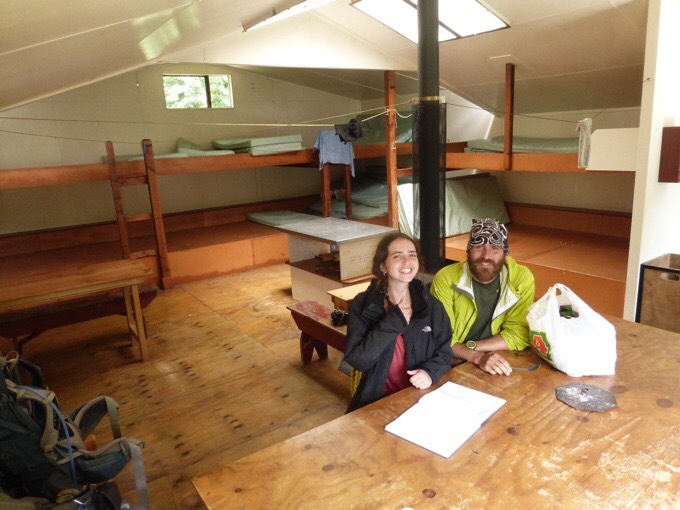 There are 10 of us and the hut has 16 bunks. Most of the people are the same group I was with last night. I haven’t gotten to know anyone all that much. Just so many people and I’m already overstimulated and tired by the conditions and trail. I used my Delorme(now Garmin) inReach to get an update for everyone on the rain forecasted for tomorrow. Unfortunately, it seems to have moved up to arrive around noon possibly instead of late afternoon, dang! 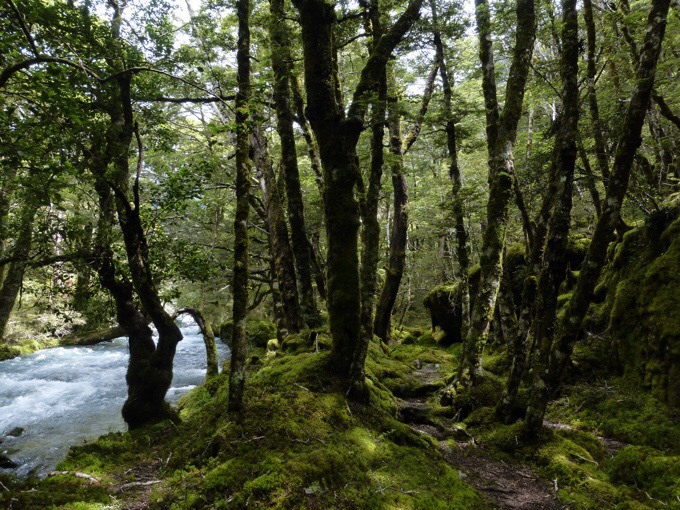 The main goal is to get past the crossing of the Waiau River just after Waiau Pass, and hope that it has had enough time to go down and be safe to pass. 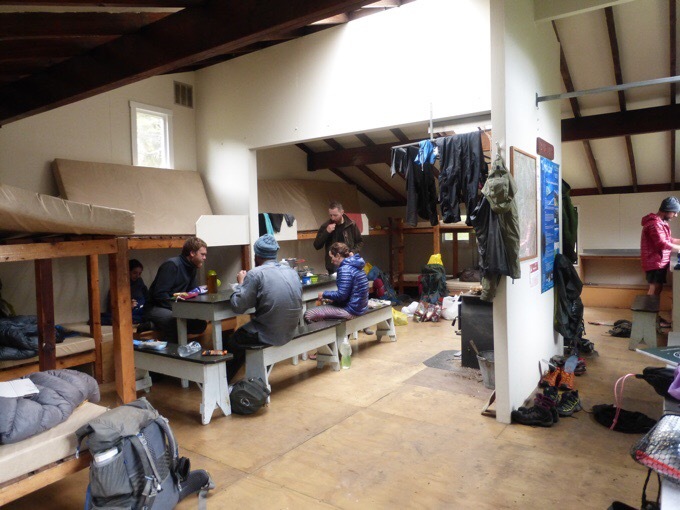 Looking at the logbook for this hut, I can see that Felix (and I think Ned is with him) just left from here this morning with many others who were here for three nights waiting on the water levels to go down after the storm. The incoming rain tomorrow looks to be two days of mostly heavy rain, so it would be essential to make it through tomorrow before it starts so I’m not stuck waiting for 3 or more days for water levels to go back down again. The goal is to put in a really long day tomorrow to end at Anne Hut. I will probably get dumped on the second half of the day, but I’ll just be happy to have gotten out of the dangerous crossings section. 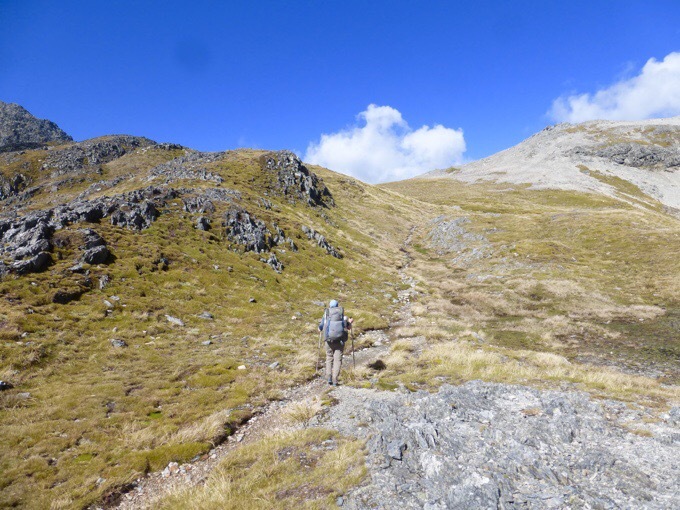 There are multiple crossings leading up to Anne Hut, so the earlier I can get going tomorrow, the better. There has been some rain tonight, but the forecast has it stopping soon until around noon tomorrow, so it hopefully has many hours to drain. I hate this water crossing stuff! I have a headache tonight and I think it’s just from feeling stress and the loud sound of all the swollen rivers/streams. I’ve tried not to think about it, but the last two days, I’ve been contemplating the water crossings tomorrow. Most of the last two days were spent next to swollen streams that sound like jet engines or trains right next to me. It’s been way too much to take in for my senses that tend to be overstimulated easily by sound. So, now I have a headache and I’m so glad that this group I’m around is so quiet and polite. We all are getting up early tomorrow to get a jump on the pass and the crossings before the rain comes. So at 8pm, everyone was quietly in bed reading. It’s just after 9pm now, and the two resident mice are running all around. I have my pack up in my bed with me, but they are bold. They even ran up the hiker poles propped up next to the counter and ran around the counter. I’m going to be paranoid all night. My plan is to leave at 5:30am with a hiker named Griggs who I last saw around the third week of this hike. We started the same day and only momentarily crossed paths a few times. He’s an American who just finished the PCT before coming here to do the TA. He’s also hiked the Colorado Trail, Vermont’s Long Trail, and in Nepal. 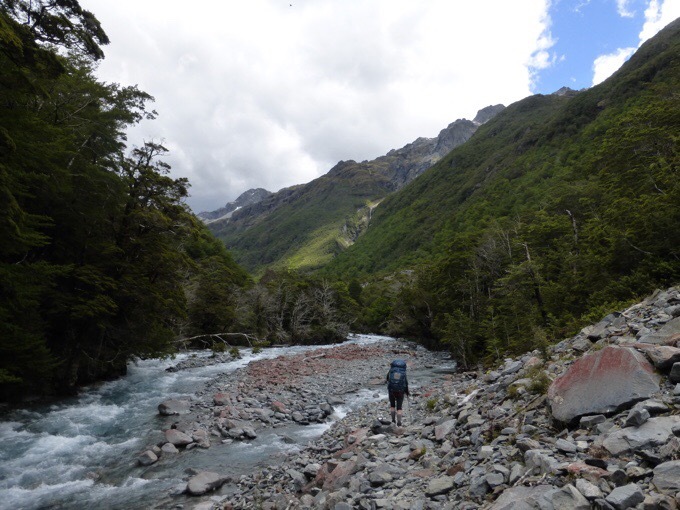 We both tend to hike solo, but seem to have similar enough pace that we’ve decided to get to the crossing together tomorrow morning just to have another person there. Everyone else is planning to leave an hour or so later and not pull the big day to the hut (they will camp somewhere) because it’s just too much. 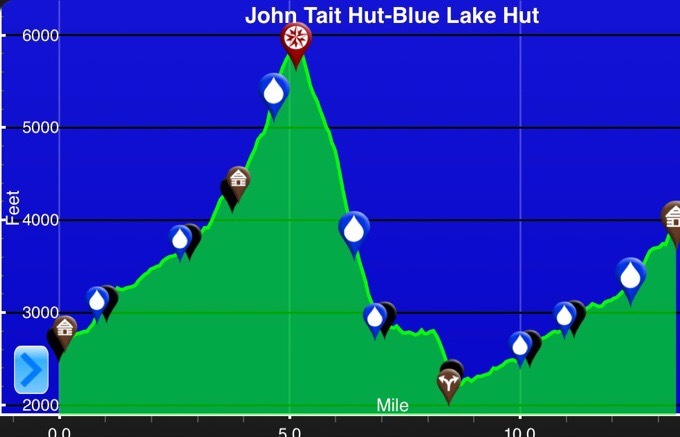 If the rain is as heavy as it’s forecasted to be, I’ll have plenty of motivation to hike all the way to the hut if the trail isn’t so flooded that it slows me down significantly. Whew, I hope all this makes sense. Basically, I’m going to hike out with Griggs at first light to push a long day and get as far as we can with an incoming rainstorm approaching and many streams/rivers to cross before it hits. Yes, it is stressful, and I hope it works. If not, I have my tent and plenty of food. If it does work, I’ll still have one more day of heavy rain on easy trail to finish this leg. Then I swear, I’m so taking a zero in Hamner Springs! 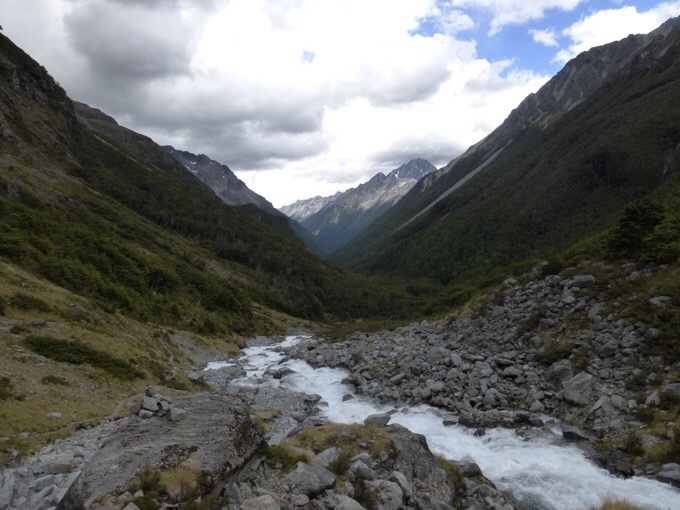 The big mountains are what I’d expected when I think of NZ. I’m still surprised by the amount of wet. 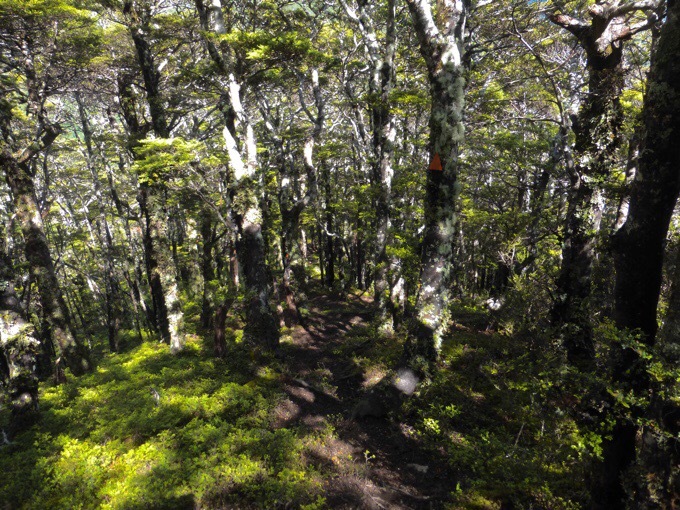 Those trail conditions ramp up the challenge. Interesting that you mention noise sensitivity and easy overstimulation. I’m much the same. Both can be exhausting. You’ve done well to manage this as a teacher. Waiting with anticipation for the next installment. It’s a cliffhanger! Glad I get to binge on this section. Good luck with the weather! Good to get an update! Hope the morning gets you through those dicey areas as planned. Some of the best scenery pics yet. Beautiful. Wow, beautiful mountains. Glad you got some nice views. You didn’t mention it but there was a ton of elevation gain/loss. You are a motor!! The Guthook app just came out with an update that now shows total elevations loss and gain totals on the charts too, yay! Gorgeous photos! 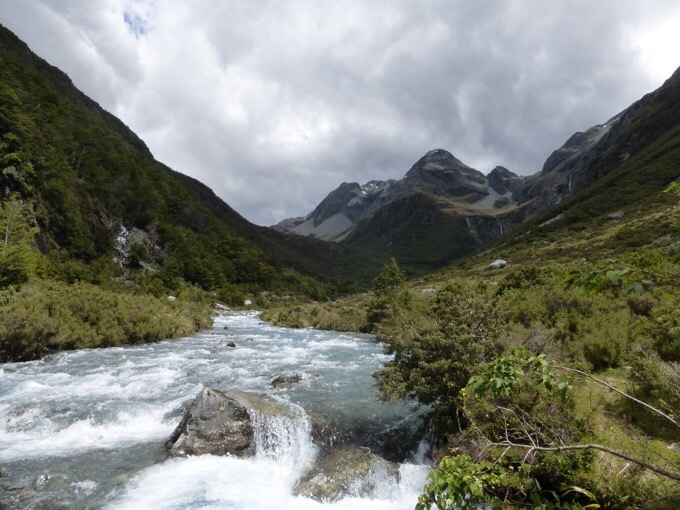 That’s what I picture when I think of the Te Araroa / New Zealand! I love the scenery.. have to imagine the sounds of water and smells of clean air. What an amazing place for that woman to paint! Also loving the huts with skylights. I took that photo and yelled over and got her phone number to send that to her. Just reminded me to send it and I hope to see what she painted. why does clock on where’s wired still show daylight time? Not sure the question you’re asking? It is generally a tracking system used for bike races. Erin, on the where’s wired link, on the guthook display there is a pop-up box on the lower left that has a running time. Currently that time is showing as 1:15am pdt. But here in that time zone it is..12:15am. That is where I notice it.. I hope you hear from the artist.